International Data Corporation (IDC) released their mobile phone market analysis for the Q2 2013, as expected Samsung and Apple continue to dominate the smartphone market. Despite the rise in number both companies have seen their shares slip in Q2 of this year compared to what they had last year. Up-and-comers like LG and Lenovo are responsible for this scenario which is always appreciated by tech lovers. Of the estimated total of 237.9 million smartphones shipped this past quarter, Samsung accounted for some 72.4 million units, or 30.4%. Despite shipping more units in Q2 than for the same period of last year, Samsung's market share dropped from 32.2%. 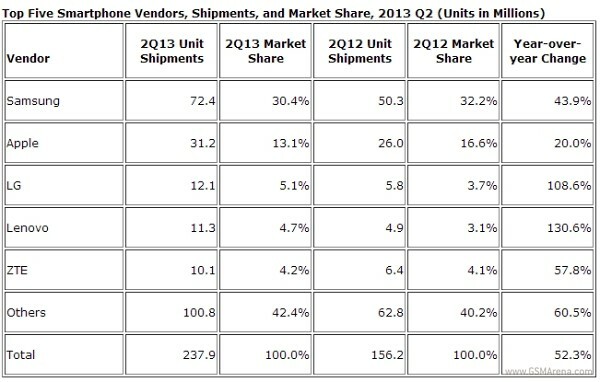 Apple, meanwhile saw its market share drop by almost a quarter to 13.1% in Q2. LG was able to ship 12.1 million units in Q2, giving it a 5.1% market share, while Lenovo sold 11.3 million units, or 4.7%. Those two saw their shipments increase by 108.6% and 130.6% YoY, respectively.